Lakhs of devotees took a holy dip at Sangam, the confluence of Ganga, Yamuna and the mythical Saraswati rivers, at Prayagraj on the auspicious occasion of Maghi Purnima today. 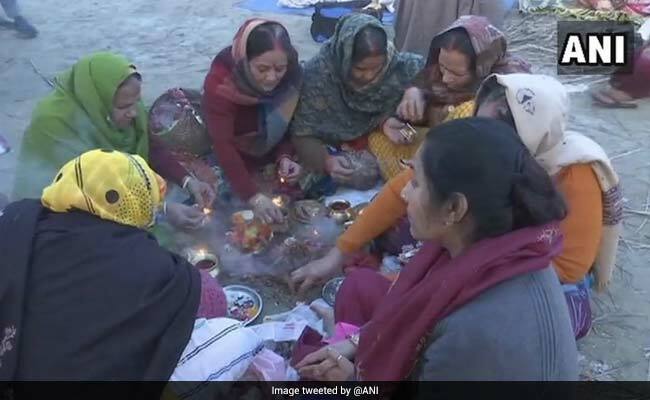 One of the last holy bathing days in the 50-day-long Kumbh Mela, Maghi Purnima, marks the end of the month-long penance period of Kalp Wasi pilgrims, known to be the most faithful ones at the Kumbh Mela. They vow to live an austere and minimalist life on the banks of the Ganga for a month. Though not a ‘shahi snan‘, or royal bath, Maghi Purnima like Paush Purnima and Maha Shivratri, is called a ‘parv snan‘ and is part of the six important bathing days during the Kumbh. Traditionally on Maghi Poornima, pilgrims today and tomorrow worship Guru Bhrasapati with the belief that Hindu god Gandharva travels from the heavens to Sangam. Chill in the air did not deter the devotees from taking a dip as early as 4 am, despite restrictions on vehicle movement near the makeshift township of Kumbh Nagri. “I have seen that the crowd picks up later in the day. So it makes sense to take the dip early in the morning,” said Aditya Langar from Pathankot, who was busy drying his clothes. “Security arrangements were tightened following the February 14 terror attack in Pulwauma,” said Vijay Kiran Anand, officer in-charge of the Kumbh. He said that there were 96 watch towers placed across the Mela area along with 440 CCTV cameras maintaining a round-the-clock vigil. “Maghi Purnima” was also crucial for the securitymen as thousands of devotees who had taken a one-month-long ‘Kalp Vaas‘ will be returning on Tuesday,” said senior police officer, KP Singh. Forty nine special trains and 2,500 buses have been pressed into service by the administration to ferry devotees from faraway places to the Kumbh on Maghi Purnima. According to the administration, over 1.5 crore devotees are expected to take the holy dip by the end of the day. As many as 40 bathing ghats have been prepared to manage the crowd.